Ambient electronica isn't usually my thing. Therefore, I normally wouldn't seem like the Minion most likely to review anything by dark ambient, New Hampshire band Horchata (really the brainchild of Mike Palace). However, once upon a time, I sat through a two Mac band at last year's Independent Georgia festival, and I enjoyed it to boot. So, with many things piled upon the respective plates of other Minions, I got handed a Horchata CD and sent off to write a review. 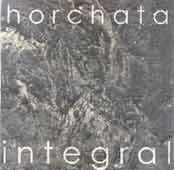 Here I sit, pondering Horchata's disk, Integral. Scarily enough, I like it. It seems like a decent soundtrack, although I have to say a couple of songs are vaguely creepy in a wintry sort of way. For instance, the second song Wind isn't the sort of thing I'd like to play before I go to bed. With the vaguely animalistic sounds in the background and the cold brittleness of the wind effect, it's the sort of song that would induce me to have nightmares about being lost in the woods on a cold fall night with a whole lot of nature surrounding me and thinking of me as being, perhaps, dinner. Of course, after a good three minutes of these effects, the track moves into a more gentle tune, although the hint of menace remains behind the entire thing. Likewise, the undertrack of Root has the eeriness of Tim Burton's Sleepy Hollow, despite the more discordant sounds which provide the melody (as it were) for the rest of the song. Other songs are also very evocative, if not soothing. And this is the case with Horchata -- the simple one word titles such as Leaf or Rust seem designed to lead the listener to think about an object, if not an entire mood. Of course some of it doesn't make sense -- how does the futuristic droning beat of Tar invoke anything remotely gooey-y? Similarly, although the staccato pattern of Rain could certainly lead one into pondering rainfall, the more mechanized patterns of the song don't have the naturalistic quality of some of the earlier work on Integral. Nevertheless, I stand by my first impression: I like Integral. But the question remains: why? After considering this question for a while, I began to think about one of my other non-Minion interests, silent film. In the case of both the silent film as well as Horchata, the artist/director most relies on the listener/viewer's other senses to create the moods that would usually be provided by voice. Although some people might consider the palette to be therefore limited, it requires a different skill to maintain the imagery and/or tell the story. Likewise, it seems to require a more active mental state for the audience to interpret and understand what is going on. In the best non-vocal music, much like in the best of silent film , the artist can explain themselves in such a way that the audience gets the point without having it hand-fed to them. In Integral, Mike Palace manages to invoke his imagery easily and maintain his mood, much like the best of the Silent Films. Therefore, this album seems like a successful effort.